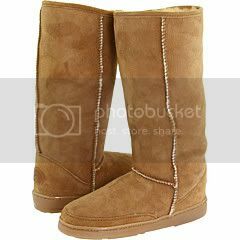 The difference between the "Sheepskin" and the "Classic Sheepskin"? If you look at the photo on the left, you will see the "Sheepskin" version in a 14" height. They have a reinforcing strip on the front of the boot, where the "Classic" version has a smooth upper about the foot area. The Classic version also boasts some highlights on the inner sheepskin, giving it a bit of an added look. Our favorite: The Classic 9" boot. Very very comfortable, and quite well made. Well worth the money - and they generally cost less than other more popular brands (even though they are known to have a better build and a stylin' look).